This post owes much to Professor Philip Sabin, author of the article The Face of Roman Battle, published in The Journal of Roman Studies, Volume 90(2000) pages 1-17. Dr. Sabin is Professor of Strategic Studies in the War Studies Department at Kings College, London. 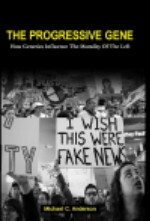 My usual process of preparing articles is to research a topic and develop a consensus between the literature and my own opinions, but Dr. Sabin’s article is so interesting that I’m going to use it as source material for the whole post. Sabin asserts that there are four areas of study that make up the mechanics of ancient battles: duration, casualties, mobility during the battle, and the role played by the supporting troops located behind the front lines. We know that the duration of ancient battles runs from the short to the long depending on the circumstances. Occasionally the adversary runs away before the first blow is struck. Other battles have been known to last all day. So how long was the average battle? Livy cites battles lasting many hours; Caesar describes a battle of several cohorts lasting five hours. The data we can put our hands on suggests a couple of hours on average. Of course the interval is not just sword play but must include maneuvers during the battle, such as re-positioning cavalry. The second area of discussion is casualties. Data shows that casualties among armies Rome defeated amount to about 50%. This contrasts with the figure for hoplite battles which ran about 14%. The difference is explained by pursuit which occurred more often in Roman times. One has a hard time imaging a hoplite phalanx dragging their heavy shields in pursuit of a retreating enemy. The Romans, however, made a practice of it. When Rome was a victor, it lost about 5% of its force, although there was the occasional “Pyrrhic victory”. So the typical Roman battle had low or high casualties on each side until the rout when the losing side’s casualties accelerated. Another factor in battle is mobility. Opposing forces would advance or give ground depending on the circumstances. We have the famous story of the ordered Carthaginian pull back at Cannae creating a “crescent” for the Romans to advance into. 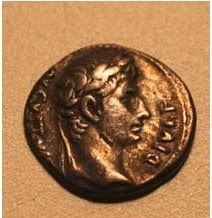 Caesar cited a case where the Helvetii fell back a mile before resuming their resistance from a higher position. In sum, mobility had the impact of influencing battle conditions depending on the terrain or composition of the armies. The impact of cavalry is well documented. The fourth factor in battle is the role played by auxiliary services. The Roman alternative to the deep hoplite formation was to advance in the familiar lines we’ve read about. The propose of this structure was to make reinforcements available to relieve the tired troops on the front line. This has been clearly stated by Livy and others. We’ve all seen the checkerboard manipular formation with gaps a maniple wide in between the units to be filled where necessary, but it’s never been clear from the history how the Romans were able to maneuver fresh troops into position during battle. Gaps are required for positioning and the fresh troops have to get into position to replace the tired ones. Let me suggest how this could have been done. 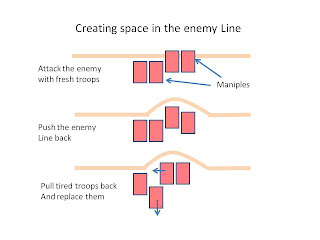 Creating space by forcing a bulge in the enemy line allows fresh troops to slide in front of those pulling back. Taking all the above factors into consideration, one can see why the Roman army was superior for so long: professional well-trained soldiers, disciplined, with the mobility to bring fresh troops to the line of battle. A formula for success. Let us now discuss in more detail the close-in combat at the front line. What was happening at the point of attack? One calls to mind othismos, the term that refers to the pushing that occurred when two phalanxes encountered each other. There has been much debate about this; how much pushing took place and what it accomplished during battle. The Romans did not fight this way. Their shields were not designed to use as a battering ram and the notion of a unified force pushing on the line would contradict the Roman design for mobility and flexibility. Caesar once commanded his maniples to spread out and make fighting room – opposite of what he would say if a concentrated force was his aim. The “Hollywood” view of Roman battles shows a charge into contact and then a series of one on one sword fights. This is as hard to imagine as the othismos. Soldiers engaged in one on one combat sacrifice protection from their comrades and leave themselves open to attacks from the rear, not to mention the whole notion of tight Roman discipline going out the window. If only the front lines fought, with those behind providing backup, how did the spacing work? Polybius asserted that each legionnaire had six feet laterally to work with, which allowed the men behind him to fill the gap when necessary. But we still have an unsatisfactory explanation because it does not take into account the fatigue factor. How could the front lines of two armies stand toe to toe and fight for hours? Adrian Goldsworthy, author of the book The Complete Roman Army has some interesting ideas about this. He first argues that three quarters of the front line was fighting defensively to stay alive as opposed to attacking. This notion has been verified by examples from World War II where the majority of troops in a firefight did not fire their weapons. This is human nature. Secondly, Goldsworthy postulates that there were lulls in the fighting where the opponents drew back and rested. Makes sense to me. Drawing back also created an opportunity to launch pila at the enemy. We have evidence of front line soldiers killed by thrown missiles after the opponents made contact. So we now see how the Roman fighting machine must have functioned, at least to the extent a little extrapolating of the history can help us get to the truth. As the empire aged it army degraded because it soldiers were not Roman, its discipline lacking, its objectives more obscure. Be a bit careful citing the WWII SLA Marshall studies on how many infantrymen fired (or aimed and fired) their rifles. There's been a fair amount of review calling Marshall's methodology into doubt. But that doesn't mean I disagree with your basic thesis, that battles had an ebb-and-flow. Although I've not personally been in real combat, I've observed this in firefights in training. Part of the Roman advantage was in training; troops were probably trained to stab not only as more effective, but also as it takes less effort. So it's likely that well-trained legions (or auxiliaries) had better stamina than many of their opponents. I didn't understand how he leaves "terrain" off that list, but then I saw from the wikipedia link that his other speciality is air warfare! In Arab accounts from the Early Islamic Period (much later than Classical Rome, but the basic mechanics of combat likely changed little), battle are explicitly described as having "karr wa farr" (lit. "repeat and retreat"). So they would attack, fight for a short time, then one side or another give ground. This then created a lull, after which the soldiers would resume combat once more (hence "karr"). Once one line completely broke for whatever reason (usually panic, which has spread from one or more points on the battlefield), the rout and pursuit would begin.